Seapark Fried Chicken Rice @ Hoe Fong. Decades of Crispy Sins. Ain’t no KFC …. but Hoe Fong’s Crispy Fried Chicken tastes good; sans the batter. Just like how grandma used to fry the chicken with minimal marinade; soy sauce, five spice powder, sugar and possibly a dash of sesame oil. Let’s take a break from the Saigon stories. The endless strings of chapters and ramblings will probably last you from Raya to Merdeka to Malaysia Day and then some. 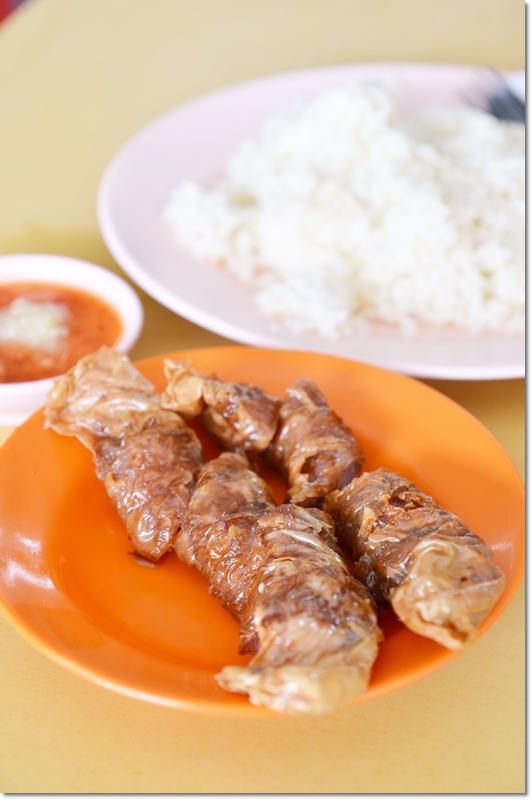 For today, let’s visit one of our frequent haunt for lunch in Seapark, PJ; Hoe Fong Chicken Rice. Blame it on the strenuous nature of the current job. I lost track of how many wonderful stories that I wanted to share with you guys. Like today’s for instance. This brunch took place at least more than a month or two ago. And I vaguely remember how I capped off the rainy day’s feast with a banter with the owner of the place; whom took over from his uncle who started this establishment back then in the 80’s. Eerie enough, the monochrome picture of his uncle (not sure if still around, and not really polite to confirm this over lunch!) hangs over the pillar facing the entrance. 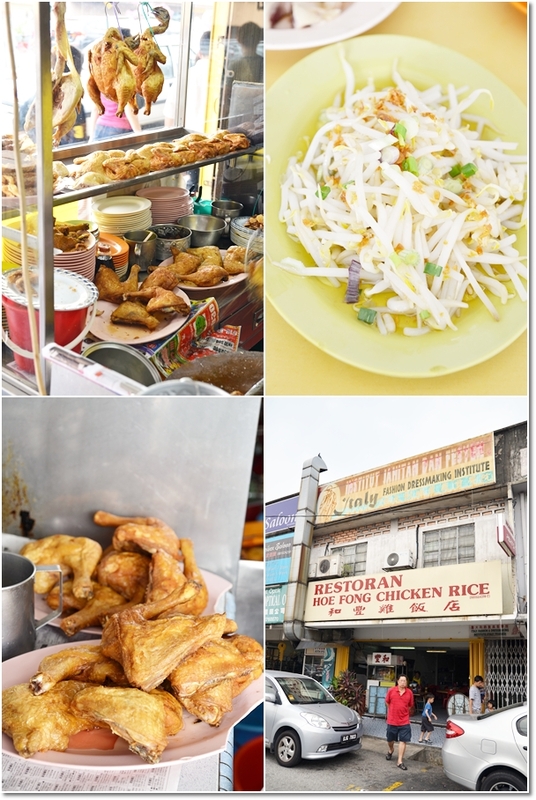 They moved to this current location in Seapark; facing the wet market and within a few doors away from Soo Kee Ipoh Chicken Noodles Soup; also a stalwart for decades in this old neighbourhood bustling with good eateries. Back in the older days, when his uncle was still running the place; the chicken rice stall was located further down the street, he claimed. Next to a 7-11 convenience store now. I am sure many of the older PJ folks could have more stories to share than this green-headed Motormouth with barely two years of dining experience in the Klang Valley. The signboard states it all; Hoe Fong Chicken Rice. Yet, don’t expect the usual poached or roasted options with white or oiled rice. Instead, open up your horizon and marvel at the sight of freshly deep fried chicken from the bubbling cauldron of oil (throw caution to the wind, for once); two large woks continuously churning out their signature creation in front of the shop. 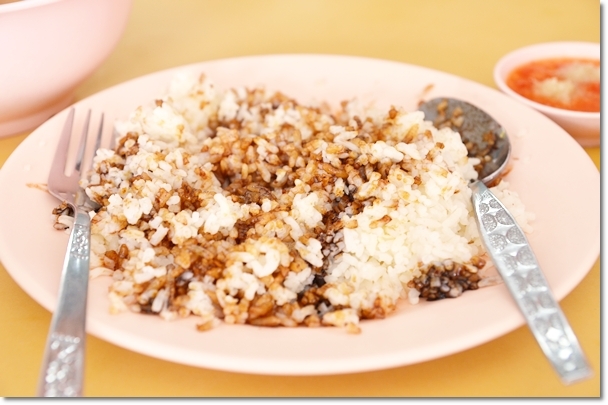 The oiled rice had this unmistakably-buttery aroma; with a delightful, fluffy texture. Although this was far from the authentic, Hainanese style of chicken rice using more of chicken oil and ginger than butter or margarine, the rice at Hoe Fong’s still trumps many other similar chicken rice stalls in Klang Valley, in my humble opinion. And the chili sauce with a dollop of fresh garlic was a nice condiment to the fried chicken and the rice. Of course, people come here for the fried chicken more than anything. Go for the crispy skin cuts, before you see them appearing on your dining partners’ plates. The chicken did retain some of the moisture although being deep fried in such a harsh manner, yet the highlight of the meal had to be the crispy skin; lightly caramelized with a faint sweetish aftertaste. The Penang Lor Bak and blanched bean sprouts were sides more than anything. Nothing to shout about; yet a chicken rice meal feels bare without the bean sprouts, no? A meal for two came up to about RM20+ inclusive of drinks. Most crowded during the lunch hours, but do come here earlier (they operate from about 10am onwards, until late afternoon. They close for dinner). Could this be the BEST chicken rice in PJ? I won’t declare so. Still prefer Loke Yun’s poached chicken or even Section 17 Hong Seng’s roasted chicken rice. This classic neighbourhood of Seapark reminded me of PJ old town and even Ipoh to some extent, with older shops housing grocery stores, an old record shop, and several more trading in an assortment of paraphernalia within the vicinity. Opens from 10am onwards, until late afternoon. Closed for dinner. does Hoe Fong opens on weekends? owh burger lab….everyone is talking about it…i’ve tried the A’han Nyonya Kuih nyonya kuih, they maintain the authenticity flavor but the price rather expensive for such small piece of kuih!! A very popular place for lunch. I’ve been there a few times but have not been back for a while – the smell of their frying chicken will stick to your clothes and hair long after the meal, LOL! eh, didnt know about this place..
thanks for the post..now got 1 more new addition place to makan . .
Great to hear that. Zhang, you KNOW how badly I wanted to search for great hawker fares in KL!